Stash busting - things just got serious! Aaaw, thanks! Let's hope I can pull it off! I feel some of your stash pain! I've only been sewing a few months, but I've managed to amass a ridiculous amount of fabrics. And of course, not one of them is appropriate for fall or winter! I think your plan looks wonderful--I wish you luck! Good to know I'm not the only one, hope you find a way to use your stash soon! Hi Marie...love the new look blog banner! Too cute and such a great idea. Yes, like you, my plans are going to be governed by my stash....which means I suspect, less of a coordinated winter capsule wardrobe, but hey, it all needs to get used sometime! I like your plans though, some very gorgeous makes in the pipeline. 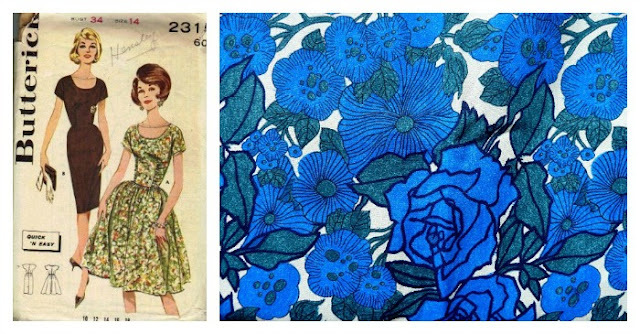 Can't wait to see your blue/ white floral double vintage dress the most. I also love that tie back blouse...is that a burdastyle? Hey Winnie...hurrah for stash-busting, even if it does result in a rather random selection! And yes, the tie back blouse is indeed from burda magazine. I can send it on to you once I've traced it if you like? Well done on your stash busting plans. I love that fabric for the Anise. I tidied my stash yesterday so am feeling a little more focussed about future plans. It's so good to have a proper sort through isn't it! I feel that if I can make a bit of a dent in my stash, a weight will be lifted from my shoulders! I am loving seeing everyone's sewing plans lately. It seems a few blogs I read are on the stash busting path. I have a few projects lined up for summer but I am just hoping I am going to get a chance to make them around baby. Oy, I'm on the opposite end of the spectrum. My stash is dismal and totally uninspiring, whereas yours is bountiful and beautiful. I have more home decor fabric than anything, and it's all terrible. There aren't many fabric stores around here for me to wander through on a regular basis, so I've been doing most of my fabric shopping online which is tedious, overwhelming and often more expensive with shipping costs. I have a couple fall items in the pipeline with fabric on the way, so hopefully it'll end up being a successful season of sewing. Good luck to you! Thanks K.Line, this is such a positive way to think about it! I am in the same spot as far as stash goes. I have a TON of fabric. I find neat stuff in the thrift stores very often, and it is so hard to pass up silk or vintage knits for under a dollar a yard! I am also trying not to buy anything. Your fall sewing plans look great! All of your fabrics are just lovely. That's it, when you see a bargain it's impossible to pass it by...and then a stash is born! Haha! I'm loving the fabric you have in mind for that Colette jacket! Very Chanel-esque. And the other fabrics aren't far behind in terms of gorgeousness, either. That flamingo knit? I'm in love! Haha, we must have an abundance of jersey in the UK then! Most of it is really cheap from the local market as well! Thanks Cecili! 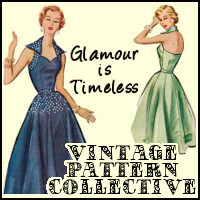 I'm most nervous about the double vintage dress...eeek! You're not alone. I just cleared out my stash and paired up patterns with fabrics too! Not brave enough to post mine though because I never stick to plans. Sounds like you have lots of lovely projects to choose from now. I applaud your rigour and will follow your example Marie. I have way too much fabric just sitting around now and considering that I have to start making space for other things I need to start working my way through it. I love that flamingo knit - perfect for Renfrew, and your knitting projects are so exciting! Looking forward to seeing all your makes. Thanks Joanne, I had no other option really..haha! That Chanel-esque jacket will be a delicious one. You've matched up your fabrics to the perfect patterns. You'll be stash busting in no time. I'm with you Marie. I'm a horrible fabric hoarder. I tell friends who are learning to sew that they should buy fabric on a project to project basis. But to be honest I look at all my fabrics and i get so happy I want to roll around in them. I love them all so much! But yeah. They gotta go! Hehe, love that image of you rolling about in the fabric Mela! I used to be like that too, but I honestly have so much that it stresses me out now! I guess it helps that they are in a wardrobe and don't see them that often. If I had to look at them often I might lose my marbles...and stop adding to the collection! Thanks Johanna, I'm a sucker for florals!!! I love your plans! And the flamingo jersey is SO cute! I blitzed my stash about a month ago and sent a few pieces to other homes via swops and ebay. THEN I discovered I had had a moth attack and threw another heap away as a precaution... so I was feeling quite smug about my neat little stash. And then I pressed "buy" on a basket full of goodies from France - oops! Hehe, France eh!?! Can't wait to see what you bought...is it from a website I need to know about please? I love your plan! Every one seems to be on the separates train this season. Maybe I need to get around to making a pledge button for that.... Super stoked to see your Anise. I agree about the Minoru - it's super cute on everyone but I think it's too "sporty" or something for me. And I can't believe you have THREE knitting projects going simultaneously. Do you switch when you get bored or....? I'm hoping I can get ONE sweater done by next spring - how do you knit so darn fast?! Thanks lady! And yes, too 'sporty' is exactly how I feel about the Minoru...even though I've loved everyone's versions! As for the knitting, I'm really not fast at all....the pretty baby blue number has been going for ever! I also think I have an inability to finish things...which I need to get under control! Oh, I just got trapped in your captcha hell - would you consider switching your comment platform to Disqus? It's really the best system, because I get notified when you've responded and vice versa - facilitates actual conversation and also, no captcha hell. It only takes about 10 minutes to set up. Oh no, sorry about that! I'm not very technical so I don't have a clue what to do, but I'll give Disqus a go! Also I returned from trip with a kip of fabrics!! Should plan what to do from them! So no new for me for next 2 month at least! Especially because I am very slow seamstress. Take your time Sveta, a least that way you can make things to a high standard and that you'll really love! Thanks Sallie!!! You know what? 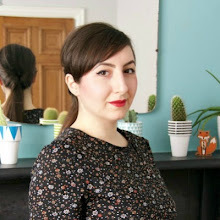 The only reason I started to learn how to knit is because I was in awe of other bloggers too! So last October (a year ago) I had some lessons and I'm so happy that I did. I'm by no means not a great (or fast) knitter, but you'll be amazed at what you can achieve in a short period of time. Do it lady, do it! I know what you mean! I haven't done much sewing over the summer, but have been buying fabric and patterns aplenty! It can make it hard to focus... 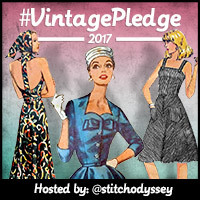 I think your plans look great and I'm excited to see Anise jacket and the vintage dress - the fabrics both look really lovely. 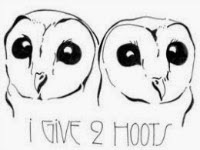 I really like your new blog banner too! Gosh, I want to see ALL of these things NOW! What a great lineup! I'm really, really, REALLY trying to stash-bust these days... I feel overwhelmed by fabric and half-finished projects. I don't buy fabric just to buy it-- I have a plan for every piece that I own-- but I don't have time to make everything that I want to! Tell me about it, time is another huge issue! I often worry that I have enough patterns and fabric for a lifetime, because with a full time job...there's not much time left for stitching :o( So it may take me a fair while to get through these plans! I'd love to be more like you and buy with a specific purpose in mind...can you please rub off on me?! You have some lovely fabrics. I really like the knitting pattern in the top right of your knitting photo montage. Would you mind telling me where the pattern is from please? If you like knitting and vintage fashions, I can't recommend this book enough! OMG. All of your projects are so, so lovely. 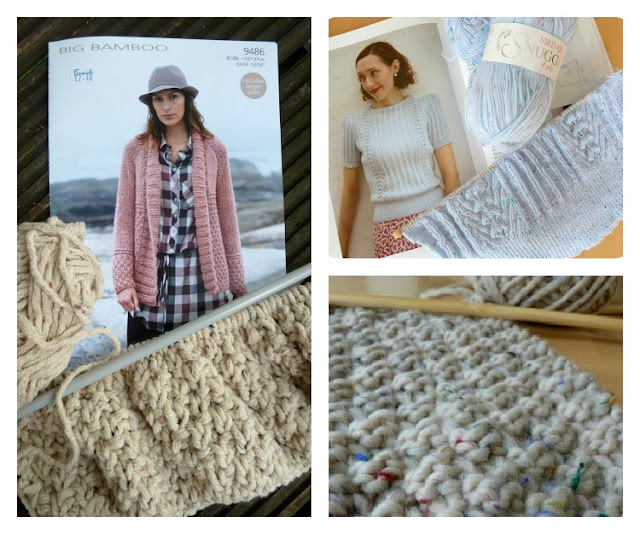 I'm loving your Anise fabric and all of those knitted goodies! Just picturing your Renfrew paired with that red skirt is making my heart swoon - I'm excited to see all of these marvelous projects! Meg, thanks so much for your comment. I was actually racking my brains to think of what I could wear my flamingo top with (I don't like blue with blue denim and I don't like navy with black denim...I need some grey jeans) but the red skirt will be the perfect match. So thank you for opening my eyes! I know exactly what you mean, believe me. I think I' m on the edge of becoming a compulsive hoarder, when it comes to sewing stuff (and a lot more, I' m afraid). I started from the house this September, and am trying to declutter it and reuse some of the fabric and various materials I have hanging around everywhere. As far as the sewing is concerned, I was thinking about the same thing; having too much fabric and many patterns I haven't tried. I do not own fabric as beautiful as the ones above, but I must sew them, at some point! I particularly liked your flamingo jersey, and the vintage flowery cotton as well! The Anise pattern, I' ll be making it myself, I hope it turns out well. Finally, the jumper you have started looks great! oh god this is me all over! If only we could make as fast as we buy, eh? I was saying to friend that I feel like I'm practically sleeping on my fabric there's that much of it and all stored at the end of my bed, I feel like I'm going to wake up one night and find it strangling me or something!! I'm quite inspired by your plans to go through my own stash and do the same! 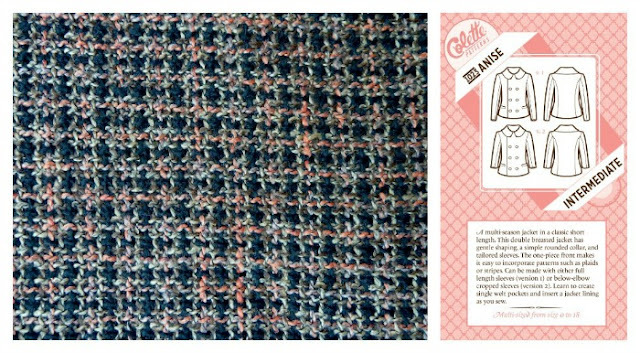 your fabric choice for the jacket is quite lovely I'm looking forward to seeing that made up, I'm also quite taken by the flamingo fabric too! Oh that vintage Butterick and blue floral fabric.... What a dream. I can't wait to see that finished. 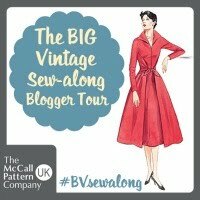 I too, am especially sad not to be joining in with Gertie's coat sew-along - it's my absolute dream shape and reminds me of a pink cashmere coat that used to be my Mum's which I lost as a teenager. That will definitely have to be revisited when I have the funds to buy a suitably delicious fabric! I am so in love with that flamingo fabric! I can't wait to see the finished top.